The following article, headlined “New Seaside Park Funtown Pier Plans Revealed” when published in February 2015, highlighted an oceanfront amusement pier owners plans to recover from Hurricane Sandy and the subsequent fire that destroyed all that stood on the site, in 2012 and 2013, respectively. The details and depth of the piece provided the only insight in the new plans, which were widely shared due to its regional name recognition and associated interest. The following is a premium feature from the pages of the new Seaside Park Sandrunner – a weekly digital news reader from the Riverside Signal. To get more real community news from Seaside Park and other local towns directly to your inbox, click here. SEASIDE PARK – An informal presentation last week of amusement pier owner Billy Major’s plans to rebuild Funtown Pier here – largely destroyed by Hurricane Sandy in October 2012 and then in totality by a fire 11 months later – included a request to consider an ordinance allowing taller rides than the borough’s current 50-foot-limit allow. 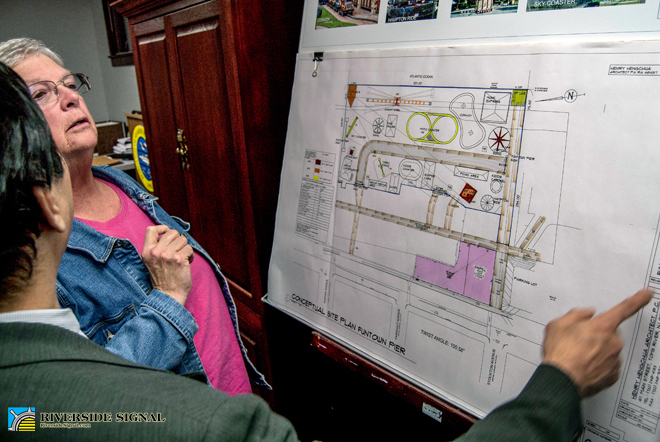 A site plan and several boards showing renderings and photos of potential rides was then presented by Toms River-based architect Henry Hengchua. 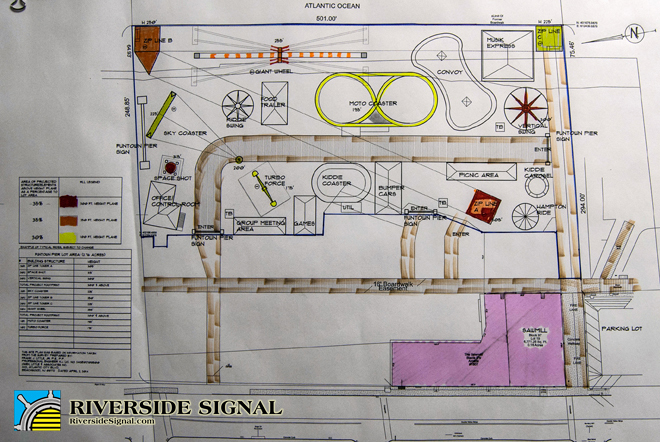 “What we have is a layout similar to what was before,” he said, walking the officials and residents present through the layout that highlighted about a half dozen potential taller rides – including a zipline, the destroyed Tower of Fear reborn as Space Shot, a sky coaster and a vertical swing, among others – while “distributed through all these areas are kiddie rides.” One rendering showed the taller pier amusements clearly visible in the skyline from the vantage point of a motorist traveling over the Thomas A. Mathis Bridge into the Seaside boroughs. It was noted several times that the rides and renderings were potential ideas and not a formal proposal of what would be installed. The attorney noted an application denied in the late 1990s to build the Tower of Fear – a 225-foot-tall freefall ride – on the pier in the borough that was rejected and eventually built anyway ten feet away within Seaside Heights on a section of the pier owned by several other families that Mr. Major leased at the time prior to Hurricane Sandy and the 2013 fire that obliterated any remaining vestige of the amusement area and nearby game stands and shops. Several board members stated concerns over visual and aural impact of the rides at night, with board vice-chair, Michael Giuliano, stating that noise traveled when the rides were at lower heights and may travel farther from higher heights. 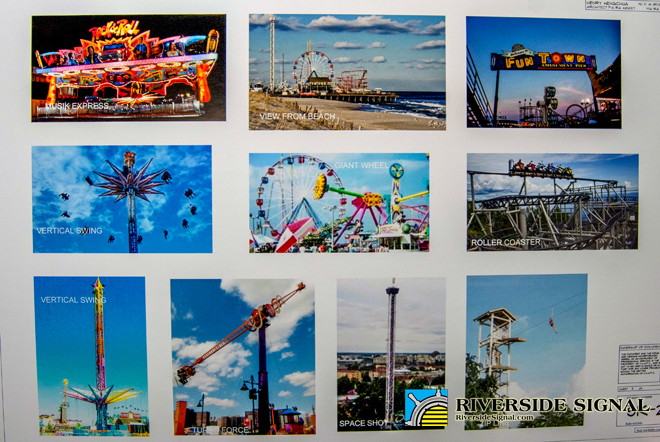 Board Member Anthony DiCaro stated he felt the rides would attract “thrill seekers” and agreed that the noise would be an issue, adding that he could hear the pier from his home eight to nine blocks distant when it was in operation. Board Member Charles “Chuck” Appleby stated that he was likely the only board member still serving from the time that the Tower of Fear was rejected and this time opposed the informal proposal due to noise concerns and questioned whether Mr. Major was mainly trying to attract patrons away from Casino Pier, several blocks north in Seaside Heights. The board then opened the presentation to members of the public present for comment. The majority of those who spoke used the opportunity to scold the board and express vehement support for the amusement pier and proposed new height ordinance. I Street resident Faye Haring started by reminding the board that when the borough had brought in two carnivals to town in the months and years since the hurricane and fire in an attempt to attract visitors to town, it did not succeed to the level that the amusement pier would have. The I Street resident added that the majority of the rides were not like the former Tower of Fear but more single to double based rides like the zipline or vertical swing, which could not hold as many patrons at one time. She closed by adding that the noise should be less of a concern, particularly at night, as most homes were equipped with air conditioning to replace having windows open all night as earlier in the 20th century. Cheryl Raley, proprietor of the Charlroy Motel directly across from the municipal parking lots that serve the beachfront and pier, was overwhelmed with emotion as she approached the board, at turns lightly sobbing and forceful in her statements. He said that his family and residents had winter breaks for the slower times to enjoy the town. Borough Administrator Bob Martucci approached the board and noted that entertainment venues are exempt from noise regulation in New Jersey. Stockton Avenue resident Pat DeGutis struck a less enthusiastic note on the amusement pier proposal than earlier residents who spoke. “I think I had to adjust quite a bit to the changing times, but I think 300 feet is more than I care to adjust to,” she said, asking how many smaller rides for children would also be present. Mr. Major estimated about 25 in comparison to the six to ten larger ones for older kids and adults. He added that if they wanted to discuss it further that he and Mr. Major could be present at another land use board meeting in the near future. Mr. Giuliano asked whether Mr. Major would be able to have anything ready for the 2015 summer season if approved. “He can’t start construction unless he knows there is a viable ordinance to allow him to put his rides there,” said Mr. Leone. The above content is (c) Riverside Signal LLC. No reproduction or usage is granted without explicit written permission. Failure to do so will result in our joyfully defending our rights to the letter of the law at the expense of the offending party.